Carnival Breeze slowly slipped through watery darkness approaching Malaga. Every now and then a sudden flash lit up the pre-dawn sky. As the sun rose through the clouds the flashes of lightning continued while rain poured from the ever-lightening sky. I couldn’t help but think of an old movie called My Fair Lady. According to a song in that movie, the rain in Spain stays mainly in the plain. Not being familiar with the geography of Spain, I have no idea if Malaga lies within a plain, but it certainly did rain. We had no set plans so we stayed on the ship and watched the weather for a bit. When the rain slowed down some we set out, chiding ourselves for having forgotten to pack our rain gear. Carnival crew members near the exit had a table of rain ponchos for sale for $3, so I bought one on the way out. Of course wearing it meant becoming a walking billboard for Carnival, but it kept me nicely dry and fit easily over my backpack. We stopped to pick up our shuttle tickets on the way through the port building. A steady stream of passengers boarded the waiting buses. Spanish buses remind me of bulls the way their mirrors curl down a foot or two ahead of the front window like the horns of a bull with his head down ready to charge. The bus filled quickly and headed off toward town. It drove out of the port, down the road a ways, and then looped back. It stopped to let us off at the entrance to the port area after having driven a comparatively long way to go next to nowhere. 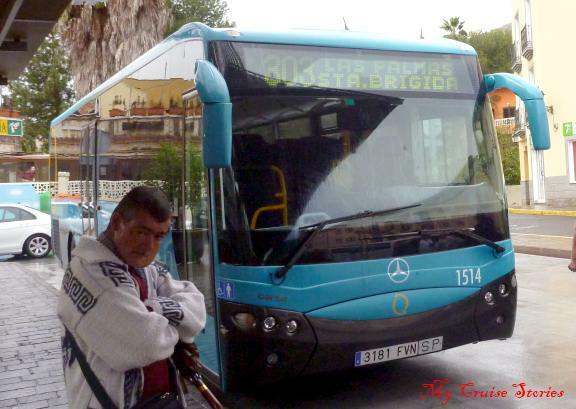 If you visit Malaga, unless walking is a problem for you, save your money and don’t bother riding the shuttle. In the time it takes driving around, or maybe even less, most people could easily walk the short distance to the place where the shuttle finally lets you off. Walking also offers a close-up view of a lighthouse along the way. We’re easily amused and got a kick out of the traffic lights. Instead of just saying walk and don’t walk in a nearly square box or just showing a hand or a person walking, the pedestrian lights more resembled old style traffic lights painted bright yellow. One light area displayed a number and one below it a little guy. On red, the number counted down the seconds until green while the little guy stood still. On green the number counted down the seconds until red. The little guy started out walking. As the remaining seconds to cross safely got lower, the little guy went faster and faster until he started running near the end. Crosswalks without lights had signs nearly as entertaining. 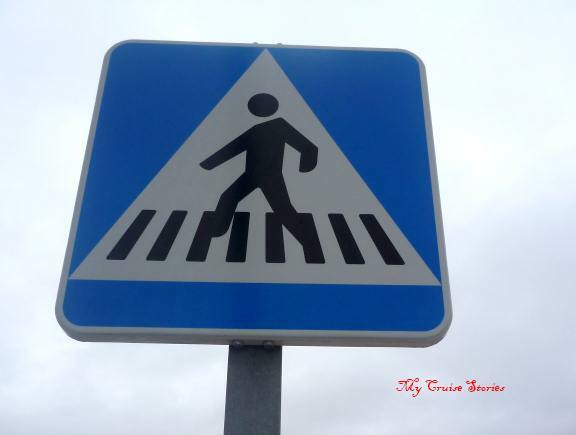 Whenever I saw one of these signs I wanted to run across a giant piano keyboard, but all that was ever there was just an ordinary crosswalk. 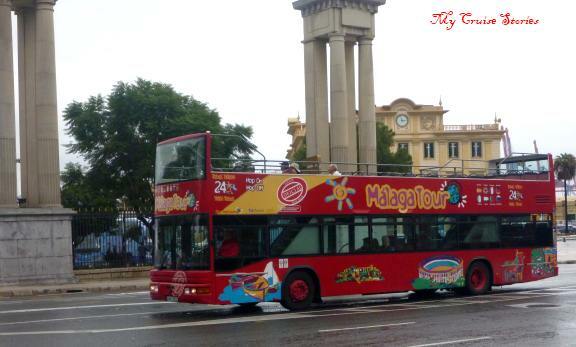 Not particularly wanting to wander about in the rain, we decided to take the Hop On – Hop Off double decker bus tour. Their tours are usually pretty good. We’ve ridden them in other places and seen quite a few sights that way. People normally prefer sitting on the top deck, but in the rain the bottom filled quickly while the top remained mostly empty. A couple stops down the way, the bus sat for a very long period of time while the driver told people standing outside it was already full and nobody wanted off. He let a bunch on anyway who said they would go upstairs. When the bus finally moved they came down and stood in the aisles dripping on everyone. The windows steamed up so we didn’t see much. Then the driver sailed on by the stop where we wanted to get off without ever stopping. Based on this, I can’t really recommend the Hop On – Hop Off bus tour in this city, though we could have just gotten a bad driver or one who didn’t deal well with rain. I do think most of the main things people would want to see on this tour were actually within walking distance from the ship anyway. At least on a day with better weather for walking about town. Someone had told us the Birthplace of Picasso museum had free wi-fi, but that was the stop we missed. Another bus passenger gave us a great tip though. They said all McDonald’s and Burger Kings in Europe have free wi-fi so we ended up spending a couple hours at a McDonald’s near the dock. It started out without many people and pretty good internet, but as the restaurant filled up the internet slowed down to the point where it couldn’t even load a picture. That turned out to be a good tip though, even in Miami when the internet went down in our hotel we could walk to a nearby McDonald’s or Burger King, both of which had free wi-fi. Back at the port we saw all sorts of people on their laptops in the area near the duty-free shops. They had internet there available for a fee. 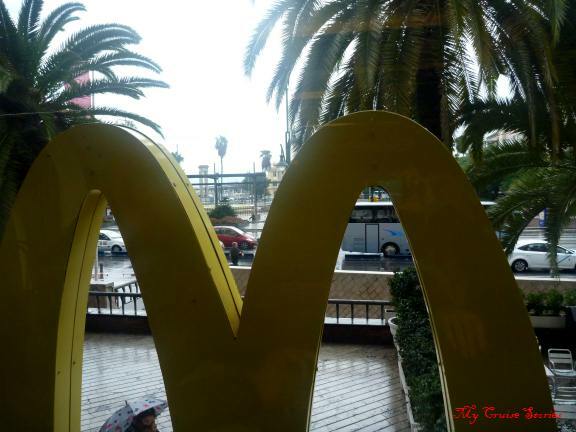 Due to the weather we spent most of our day in Malaga making use of the free wi-fi at McDonald’s rather than visiting any of the things tourists like to see. The most entertaining things we saw there were the crosswalk lights and signs. Which is not to say there isn’t anything there to see, we just didn’t see it. We did learn some valuable information though because it’s always good to know where to find free wi-fi on vacation. 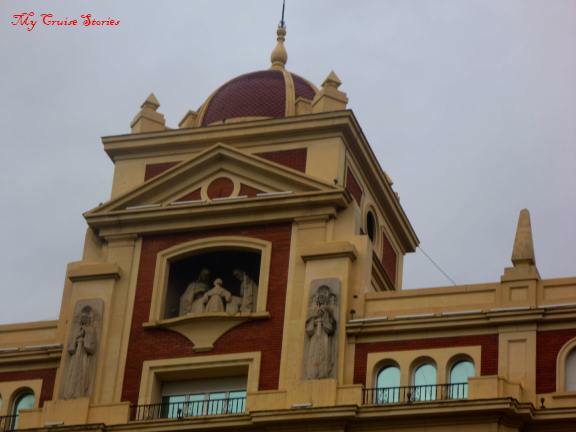 Malaga has a very rich history. The Phoenicians founded this southernmost large European city about 770 BC. It lies in the Andalusian region of Spain and enjoys a generally warm and mild climate with November as the rainiest month. Malaga later fell under the rule of the Roman Empire. After the fall of the Roman Empire much of Spain including Malaga was ruled by Islamic Arabs. In 1486 the Spaniards conquered the area and Malaga fell under Spanish rule. 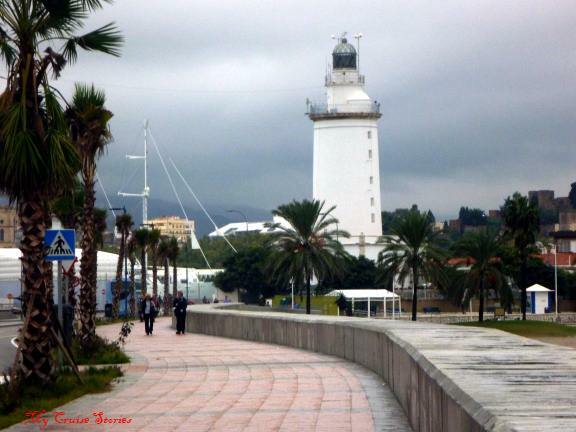 Tourist attractions in Malaga include architecture from its various past eras. It has the Alcazaba (a sort of fort), a castle, and cathedrals, as well as museums and a bullfighting ring. Cruise ship shore excursions offered bus tours to historic attractions or nearby cities, tours of nearby historical sites, a visit to a cave, or tours featuring food or wine. 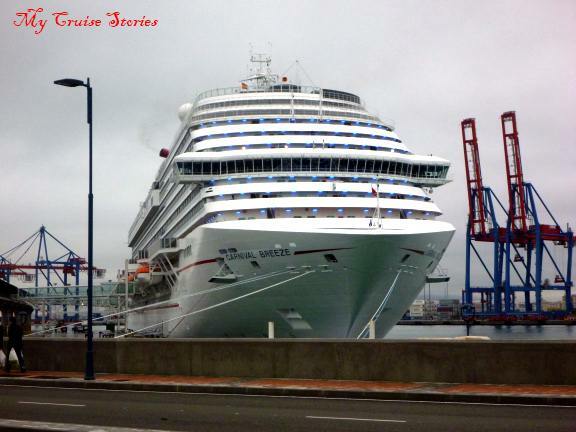 This entry was posted in Breeze, Carnival, Europe, Port Cities, Ports of Call and tagged Carnival Breeze, free wi-fi, hop on hop off double decker bus, Malaga, photos, rain, Spain, transatlantic cruise. Bookmark the permalink. I enjoy your writing! Your ‘rain in Spain’ made me laugh out loud, in addition to the fact that you are easily amused. That’s the kind of ordinary thing that always interests me, too. 🙂 Maybe we’ll cross paths on a cruise someday. We are counting down to our next cruise: 8 weeks and away we go! If that cruise you are counting down to happens to be Alaska on Holland America Westerdam we could cross paths on a cruise quite soon! We won’t cross this time. Our upcoming cruise is to the Baltics, so we’ll be on the other side of the planet. 🙂 But one of my friends is taking Holland America to Alaska in September, so I hope you share your impressions! The Baltics sounds like fun. I was in Alaska in September once before and the weather then was wonderful. (I was also there in June before and the weather not so good.) Definitely I will write about the Holland America cruise. An ordinary thing in the Philippines that I thought looked crazy was the hundreds of power lines on the power poles there. They must just run a new line any time they connect anything because I can’t see actually needing that many. I don’t think you have ever done any caves besides the cave tubing we did in Belize. Some time you should give a cave a try, we all had fun cave tubing and I have done some walking caves too. In Mexico the squatters put up their own power lines and tap into the ones going by on the street to steal the power, perhaps the Philippines has the same sort of thing going on with all their crazy wires. We did look into a cave excursion at one of the ports, but they had no pictures allowed. Also the island tour we took on Grand Canary was supposed to include a cave house (people there still live in them) but they took too long on other things and ran out of time. We got back to the ship late even skipping the cave on that tour. Good thing it was a ship’s tour! Wonderful and useful observations should I ever visit Malaga. 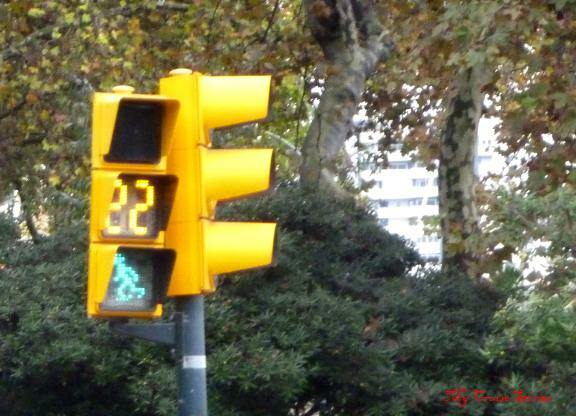 I like the use of little running figures on traffic lights and signs. What’s that about? Run or get run over? By any chance did you dine at the Micky D’s in Spain? If so, is it as bland as the Micky D’s stateside? What a drag that did not get to visit the Picasso Museum. Run or get run over, that just may be exactly what the light is trying to say. I’ve been known to go to Mickey D’s just for the bathroom. hahaha, I’ve done that….but going in the side door next to the bathrooms and not ever going where any employees saw. Couldn’t really sneak in incognito for the internet.